Back before Halloween I did a little write up on UK singer/songwriter V.V. 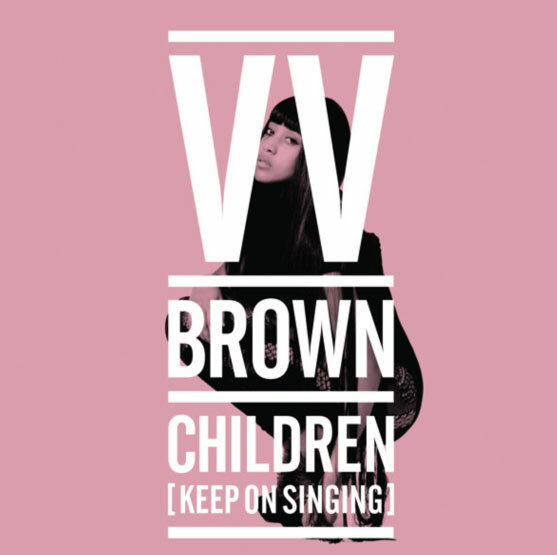 Brown's tremendous new single "Children," and of course shortly after I stopped blogging for a month, she went ahead and released the official music video for the song. The song offers listeners a little lick of what's to come from her sophomore release, Lollipops & Politics, due February 7th via Capitol Records here in America. Written by Brown as well as C. Harmon, E. Kidd Bogart & Chiddy (of Chiddy Bang fame), the latter whom also raps on the track. When the song starts, you don't really know what of make of it. "Where is this going?" Of course, being that it's V.V. Brown we're talking about, it doesn't take long before it ascends into pop greatness. This unconventional little pop tunes samples the familiar ice cream truck jingle ("Do Your Ears Hang Low") likely recognized by little children everywhere. The song is slathered in originality, something that Brown has always brought to her tunes. It's funny that I say "always." Girl has only released one album, yet here she is acting like she's been doing this for years. She amazes me. Buzzed about in her native England long before she made a splash stateside, V.V. Brown's critically acclaimed debut album, Travelling Like The Light, was released in the UK back in July of 2009 and finally in the states in February of this year. Brown wrote and co-wrote the entire 12-track album and worked with producers such as Kid Gloves, Steve Dub and Jeremy Wheatley While the album was chock-full of quirky little pop gems, the most successful single released was "Shark In The Water." Most successful, I say, because none of her other singles charted at all. "Shark In The Water" was the song that introduced Brown to North American TV audiences, with prominent placements in popular TV shows Degrassi and Ugly Betty. Surprisingly enough, the single was more successful overseas than it was in the UK, where it stalled out at #34 on the Official Singles Chart. In France, "Shark In The Water" peaked at #13 while here in the States it did respectably well for an otherwise unknown singer from England, going Gold and peaking at #67 on the Billboard Hot 100. The song also fared well in other formats, coming in at #20 on Billboard's Hot Adult Contemporary chart and an amazing #11 on the Billboard Hot Dance Club Songs chart. Her album charted respectably, peaking at #30 at home in the UK, #16 in France and #179 on the tough to crack Billboard 200. "Children" is the first single released off the new album and the first tease of what V.V. Brown has up her sleeve and if it's any indication of what we can expect to hear on the new record, I think we're all in for a sweet treat. Check out the very "REAL" video for "Children" below, shot in Los Angeles and look out for some sick dance remixes from Mike Rizzo, Twice as Nice, Club Cheval and Easy Does It. Download "Children" featuring Chiddy on U.S. iTunes HERE.